Egypt is committed to establishing peace in Libya, whether through trilateral talks with Tunisia and Algeria, or in direct dialogue with Libya, its neighbouring countries, the United Nations, the African Union or the Arab League, Egypt’s foreign affairs ministry spokesman Ahmed Abu Zeid told Ahram Online on Wednesday. Abu Zeid's comments come in response to statements by Tunisian President Beji Essebsi to Tunisian Leaders Magazine this week, saying that Algeria proposed an initiative to solve the Libyan crisis and that Egypt, Tunisia and Algeria will meet in a trilateral summit to discuss the country's situation. Abu Zeid said he had no details on the date of the proposed summit but that the three countries “would meet soon” in a general meeting with other neighbouring North African countries. According to Abu Zeid, these efforts included hosting over 48 influential Libyan figures, under the supervision of Egypt’s army Chief of Staff Mahmoud Hegazy and the Egyptian Foreign Affairs Minister Sameh Shoukry. 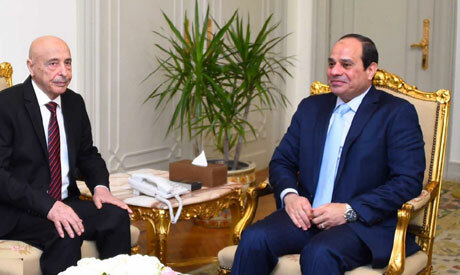 Egypt also hosted in 2016 Libya’s House of Representative speaker Aguila Saleh, who met with Egypt’s President Abdel-Fattah El-Sisi last week and conveyed his intention to call the parliament to consider the proposed changes in the Sikhrat agreement. The Sikhrat agreement, which was reached in Morocco in 2015, mandated the reaching of a peaceful transition of power in Libya and the establishment of a national unity government. There are currently five proposed amendments in the agreement, including a change in the makeup of the Libyan national dialogue committee to better balance the country's factions, a change in the duties of the army commander, and measures to maintain the independence of the armed forces and separate them from political conflicts. Abu Zeid added that in 2017, Egypt would continue its efforts to reach a consensus between all Libyan factions. Libya currently has two parliaments and two rival governments, which have effectively divided the country into east and west. The parliament and interim government in the eastern part of the country are refusing to endorse the UN-backed administration in Tripoli in the west, a prerequisite for the Tripoli camp to take sovereign control of the country.